Whisk whipped cream with vanilla in kitchen mixer until fluffy and thick. Add the yogurt and whisk for another minute. In a separate bowl, whisk in the kitchen mixer the egg whites until you have a meringue. Add the sugar in 2 parts and continue whisking until the meringue is compact. Then, add the meringue and the finely chopped nuts in the yogurt mix and stir gently with the spatula until you have a homogenous mix. Empty the mix in a stainless bowl with a lid and place in the freezer for 1 hour, to firm up. Remove from the freezer and stir with the spatula until fluffy. Repeat this one more time. Place the ice cream in the freezer to freeze well. To serve, leave outside to soften. 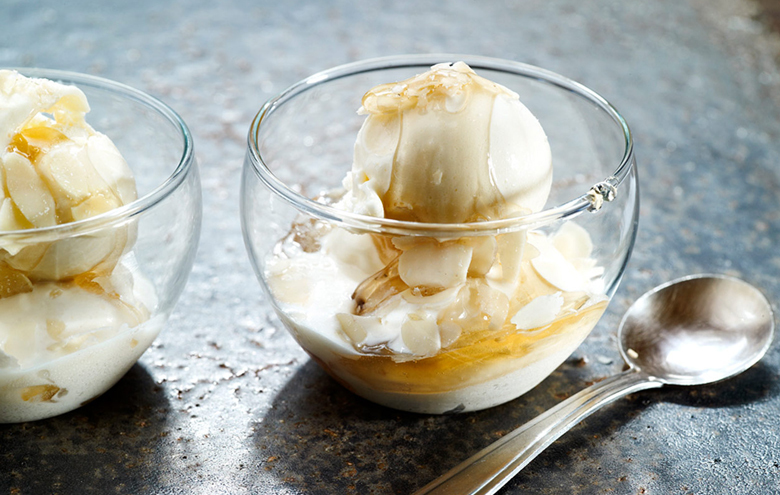 Serve the ice cream in bowls covered with some honey and finely chopped nuts.